and carefully worded their “Meter Choices” so that all they had to do is say they could no longer find Analogs, and had to use RadioOff Meters instead. 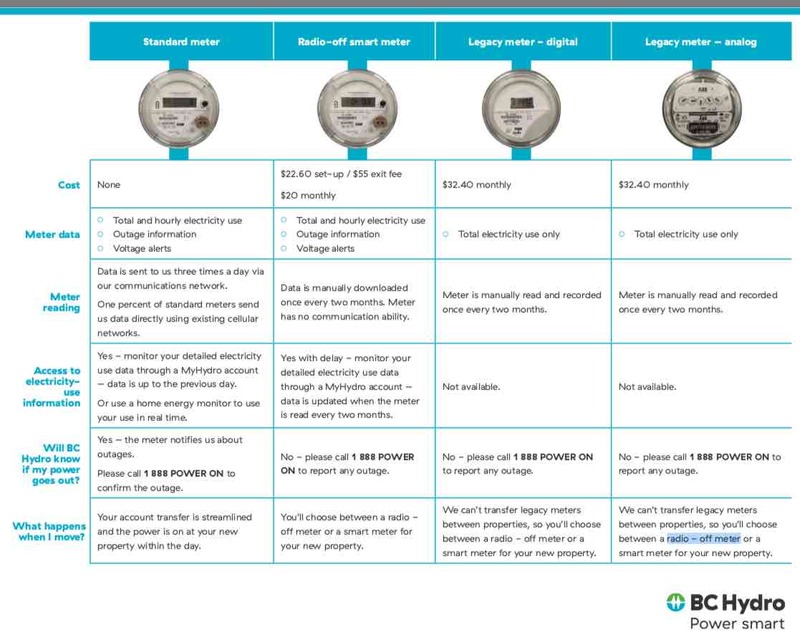 BC Hydro submitted to the BC Utilities Commission today the enrollment figures for the Meter Choices Program. The Commission is in the process of independently reviewing fees for the choices to ensure BC Hydro is only recovering the additional cost of providing and servicing the radio-off and analog options. The Meter Choices fees were approved on an interim basis by the Commission in October. If the final fees differ from the interim rate, BC Hydro will adjust customers’ bills accordingly. 450 customers elected to take a radio-off meter. The remaining 13,110 customers did not contact BC Hydro and will retain the old legacy meter by default. In total, about 19,380 customers will now have a monthly legacy meter fee – this represents one per cent of the total number of BC Hydro customers. Those fees were effective Dec. 2, 2013. Customers who requested a radio-off meter will see the fees applied April 1, 2014. BC Hydro expects the enrollment numbers to evolve over the coming months as the utility continues to confirm customers’ choices. Adding another 48,240 smart meters to the system will bring the number of BC Hydro customers benefitting from the modernized grid to 99 per cent. Modernizing the electricity grid plays a crucial role in BC Hydro’s plan to provide a secure and reliable power system for customers all over the province. Once complete, a modernized grid will help BC Hydro improve its management of the electricity system, lower costs, reduce theft, encourage conservation and automatically detect outages. 95 per cent of customers with smart meters have been transitioned to automated billing. 90 per cent of customers with smart meters can view their detailed energy use through their secure online MyHydro account – helping them to save energy and money. 2,100 pre-existing unsafe meter socket conditions on customers’ homes were repaired by a certified electrician at no cost to the homeowner. keeping an old meter for a $35 monthly fee as long as stocks last. The fees to retain an old meter or choose a radio-off meter ensure the vast majority of customers who have accepted a smart meter are not subsidizing the choices of a very small number of customers. This consolidation is current to November 27, 2018. (c) failed installation costs from customers at a premises where a failed installation occurred. (2) The commission must allow the authority to establish a regulatory account for the recovery of costs referred to in subsection (1) (a) (ii) and (1) (b) for the period from January 1, 2013, to March 31, 2014. (3) Within 30 days of the date this direction comes into force, the commission must issue an order so that the Electric Tariff of the authority is amended by adding the provisions set out in the Appendix to this direction. (4)Â The commission must not do anything to amend the provisions added to the Electric Tariff under subsection (3), except on application by the authority. 4 (1) The commission must not exercise a power under the Act in a way that would directly or indirectly prevent the authority from installing, operating or providing services in respect of legacy meters, smart meters and radio-off meters. (b) an applicable customer, if a smart meter is installed at the applicable premises of the applicable customer on or after the date this direction comes into force. (3) Without limiting subsection (1) of this section, the commission must refrain from exercising its power under section 45 (5) of the Act to the extent to which the section is applicable with respect to the installation and operation of legacy meters, smart meters and radio-off meters. InterpretationThe definitions in Direction No. 4 to the British Columbia Utilities Commission apply to sections 4.2.1 to 4.2.4 of this tariff. BC Hydro’s standard meter for measuring Electricity consumption and (if applicable) demand at a Customer’s Premises is the Smart Meter. Except as set out in section 4.2.2, in all cases BC Hydro will install a Smart Meter at a Customer’s Premises.Notwithstanding the preceding paragraph, but subject to the conditions specified in section 4.2.2 being satisfied in each case, BC Hydro will permit to remain in operation, install, replace, maintain and service Legacy Meters and Radio-off Meters at a Residential Service Customer’s Premises for the periods specified in sections 4.2.3 and 4.2.4. 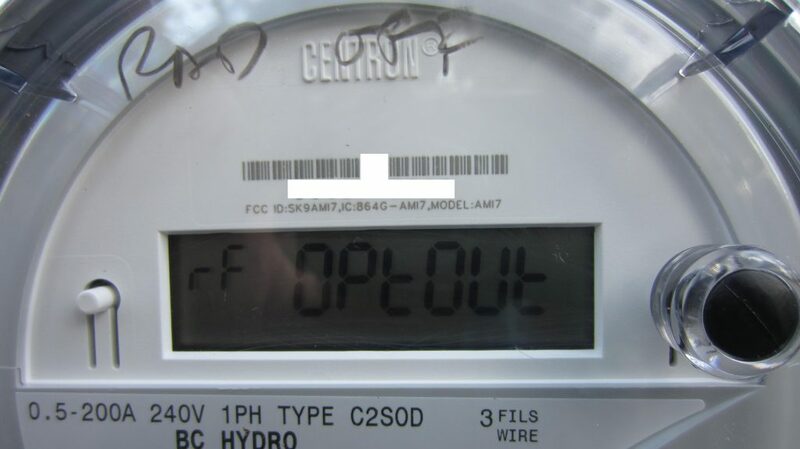 The conditions that must be satisfied in order for BC Hydro to permit to remain in operation, install, replace, maintain and service Legacy Meters or Radio-off Meters at a Residential Service Customer’s Premises are:(a) the Customer is, as of the date of the Customer’s election in accordance with clause (c) or deemed election in accordance with clause (d), taking Residential Service at the Customer’s Premises;(b) BC Hydro had not, before the date of the Customer’s election in accordance with clause (c) or deemed election in accordance with clause (d), installed a Smart Meter at the Customer’s Premises, but rather a Legacy Meter remained in place at those Premises as of the date of the Customer’s election or deemed election; and(c) the Customer, during the period beginning September 1, 2013 and ending December 1, 2013, by notice to BC Hydro, elects to retain the Legacy Meter then in place at the Customer’s Premises, or to have a Radio-off Meter installed in place of the Legacy Meter; or(d) the Customer, despite satisfactionof the conditions set out in clauses (a) and (b) has failed to provide notice of election to BC Hydro in accordance with clause (c), in which case the Customer shall be deemed to have electedeffective December 1, 2013, to retain the existing Legacy Meter at the Customer’s Premises and the Customer shall thereafter pay the charges for having a Legacy Meter installed at the Customer’s Premises as set out in the Schedule of Standard Charges. (a) A Customer who has elected, or is deemed to have elected, to retain a Legacy Meter can continue to retain the Legacy Meter until the SEAL OF THE METER EXPIRES, or the meter ceases to function properly, whichever comes first. (b) as the occasion arises. For purposes of this section, BC Hydro will only be deemed to have suitable replacement Legacy Meters in its meter inventory if it has existing verified and sealed Legacy Meters in its meter inventory as of the date that a Legacy Meter in place at a Customer’s Premises requires replacement, and BC Hydro is under no obligation to repair, rebuild or modify, or re-verify and re-seal, any Legacy Meters that have been removed from service for any reason, nor to purchase or otherwise acquire from any source any Legacy Meters in replenishment of its Legacy Meter inventory. (c) In any case where the seal of a Legacy Meter expires, or the meter ceases to function properly, and BC Hydro does not have a suitable Legacy Meter in its meter inventory available for installation, BC Hydro will install either a Smart Meter or a Radio-off Meter at the Customer’s Premises, at the Customer’s election. A Customer with a Legacy Meter installed at the Customer’s Premises can also elect to have a Smart Meter or a Radio-off Meter installed in place of the Legacy Meter at any time. A Customer who elects to have a Smart Meter or a Radio-off Meter installed at the Customer’s Premises cannot later change back to a Legacy Meter at the applicable Premises. (d) A Customer with a Legacy Meter in place at the Customer’s Premises who moves to another Premises for which the Customer is eligible to take Residential Service, can elect to have a Smart Meter or Radio-off Meter installed at the new Premises, but cannot retain or have installed a Legacy Meter at the new Premises. Except where a Customer who is eligible to elect to have either a Smart Meter or a Radio-off Meter installed in a new Premises moves into the vacated premises and elects to have a Radio-off Meter installed, the vacated Premises will in all cases have a Smart Meter installed. (e) A Customer with a Legacy Meter in place whose service is terminated for any reason whatsoever ceases to be eligible to retain a Legacy Meter, and if that Customer again takes Residential Service at the same or another Premises the Customer can elect to have either a Smart Meter or a Radio-off Meter installed upon resumption of service. (f) In any case where a Customer ceases to be eligible to have a Legacy Meter installed at the Customer’s Premises, or BC Hydro no longer has suitable Legacy Meters available for installation at the Customer’s Premises, and the Customer is required to elect to have either a Radio-off Meter or a Smart Meter installed instead, but the Customer refuses or fails to make an election within 10 days after BC Hydro has delivered written notice to the Customer’s Premises notifying the Customer that he or she must elect either a Radio-off Meter or a Smart Meter, the Customer will be deemed to have elected to have a Radio-off Meter installed and the Customer shall pay the charges for having a Radio-off Meter installed at the Customer’s Premises as set out in the Schedule of Standard Charges from the date of BC Hydro’s installation of the replacement Radio-off Meter. This entry was posted on November 17, 2018, 6:30 pm and is filed under British Columbia, Canada, Itron, Itron CENTRON II, OPT-OUT, Radio Off, Smart Meter. You can follow any responses to this entry through RSS 2.0. You can leave a response, or trackback from your own site.